Giving voice to written work can add layers of meaning while specifying our intent and charging the inky symbols on the page with emotional and intellectual substance. 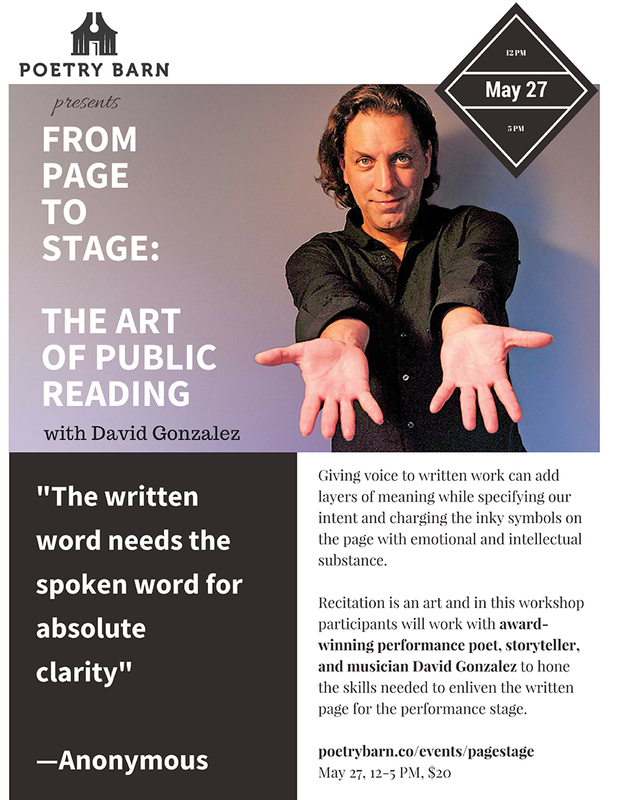 Recitation is an art and in this five-hour workshop participants will work with award-winning performance poet, storyteller, and educator David Gonzalez to hone the skills needed to enliven the written page for the performance stage. Through warm-ups, experiential learning, preparation, performance, and critique participants will work on: Physical Presence, Voice and Articulation, Dramatic Appropriateness, Evidence of Understanding, and Overall Performance. Please bring at least three poems of varying length and style to work on, and wear loose-fitting clothing. Includes mid-day break with light picnic lunch!